We are dedicated to giving our customers quality you can count on. Whether it is in the products you buy or in the people we send to install and work on it for you. If you are not completely satisfied, just give us a call, and we will come back and explain in detail the installation or service that you received, and if necessary or possible, fix it until it works correctly. We sell Amana and Lennox central air conditioning systems as well as systems for mobile and modular homes and Mini-split Systems. We are a Mitsubishi Diamond Dealer. Click on the links below to learn more about Amana, Lennox and Mitsubishi products. A separate window will open so you don't have to worry. You won't leave our site unless you choose to! in downtown Black River Falls, Wisconsin. How a Central Air works! The typical central air conditioning system is a split system, with an outdoor air conditioning or "compressor bearing unit" and an indoor coil, which is usually installed on top of the furnace in the home. 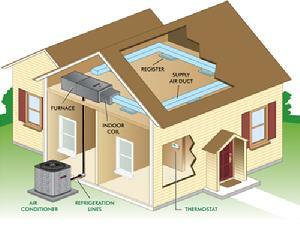 Heat and moisture are removed from inside the home is blown over the cooled indoor coil. The heat in the air transfers to the coil, thereby "cooling" the air. Central air conditioning can also be provided through a package unit or a heat pump. Give us a call to see which system would best suite your needs.